Fully depress the clutch pedal to operate the shift lever and change gears, then slowly release the pedal. When you are not shifting, do not rest your foot on the clutch pedal. This can cause your clutch to wear out faster. Do not shift to before the vehicle comes to a complete stop. Shifting to before stopping can damage the transmission. Before downshifting, make sure the engine will not go into the tachometer’s red zone. Should this occur, it can severely damage your engine. There is a metallic part on the shift lever. If you leave the vehicle parked outside for a long time on a hot day, be careful before moving the shift lever. Because of heat, the shift lever may be extremely hot. If the outside temperature is low, the shift lever may feel cold. If you exceed the maximum speed for the gear you are in, the engine speed will enter into the tachometer’s red zone. When this happens, you may experience a slight jolt. The manual transmission has a lockout mechanism that stops you from accidentally shifting into from a forward gear while the vehicle is moving at a certain speed. 1. Depress the clutch pedal, move the shift lever all the way to the left, and shift to . 2. 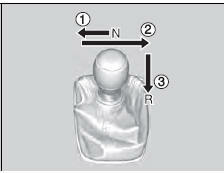 If you still cannot shift into , apply the parking brake, and turn the ignition switch to ACCESSORY or LOCK . 3. Depress the clutch pedal and shift into . 4. Keep depressing the clutch pedal and start the engine. Have the vehicle checked by a dealer if you have to go through this procedure repeatedly.